I had a lunch meeting today and since I got to choose, I chose Japanese…because I’ll ALWAYS choose Japanese. Or Mexican. But one of those is what I ALWAYS choose. Unless it’s my favorite pub and those Irish Spring Rolls ~ Oh MAh GAWD ~ those Irish Spring Rolls are to die for. Yep, I’ll ALWAYS choose Japanese, Mexican or J. Mac’s. Where was I? Oh yeah, Japanese for lunch. Now, I do love some Teriyaki Chicken and Fried Rice and LOTS of Shrimp Sauce, but I really love those fortune cookies….like they are gonna turn out to be the truth and nothing but the truth. Like any good horoscope reading chic, I never toss them ~ they are read, studied and analyzed. And today’s was pretty cool….so I just snapped a pic and tossed it all willy-nilly. I had a moment of panic as I got in the car because I didn’t have it to add to my stash, but I’m looking ahead and trying not to be a hoarder that Tater has to help clean up after when I die. (Just think…she’ll find 1,732 fortunes and think…’Damn, Sasha, you couldn’t throw away a fortune???’). So yeah…that. I think I’ll have that tattooed somewhere, cause THAT’s absoflippinlutely fabulous!! Previous Did I seriously Just FAIL a test from a Magazine??? Next You can’t MAKE me! Thank you for everything…..all of the jokes and Margaritas and your lovely recipes. I enjoy reading your Facebook entries EVERY DAY. AND, now that I signed up for your blogs, this will truly make my day! As we get older, we are STILL A LOT OF FUN..no matter what!! Sasha, I got one recently that said, ignore your last fortune cookie fortune! …..lol and Susan Ogren we always say that…. and the other routine we do is … you cant take your own fortune cookie, you have to give it to someone. Weird! yep! lol Sasha, Japanese/Chinese or Mexican would be my choice also…. and perhaps Tai…. ❤ ya to pieces! Kathleen ~ first of all, thank YOU! And I would crack up if my fortune cookie said ignore the last one….makes me wanna make some with that inside – ha! and hmmm, never had Tai…. 😀 Cheers girl!! My hubs is about to retire. June to be exact. 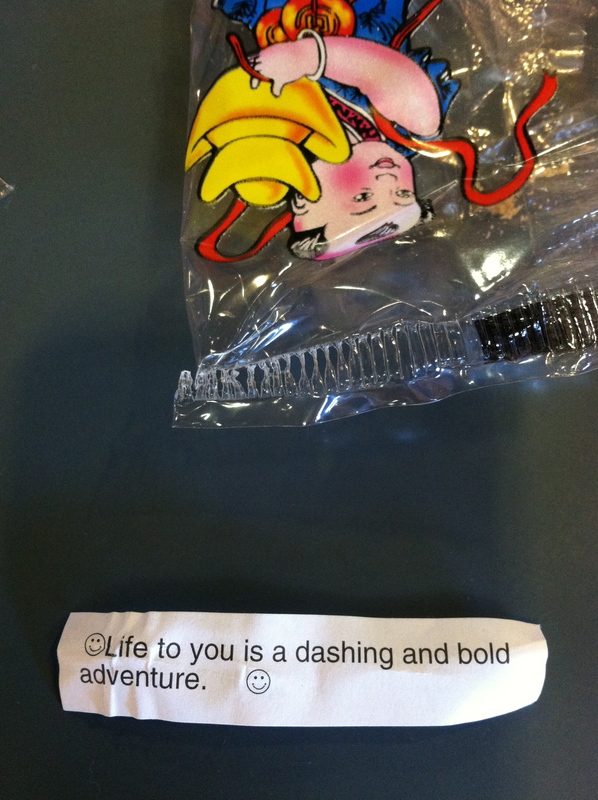 We had Japanese last night and I got my little cookie, opened it up, read the following ~ “Good things await you. Save the date, exactly 4 months from now.” ~ Well of course I said “Wait, wait, wait! I have your fortune. You must have mine.” He took the fortune I had opened and handed me his. OMG!!! They both said the same freaking thing! So, I guess “Good things await US.” 🙂 We are definitely saving the date! THAT is so cool….I know they are written by a bunch of people in some factory somewhere and there are really only so many, but I’m not willing to tempt fate, karma and juju just yet ~ Good for ya’ll! I am so glad to know that someone shares my difficulty discarding those little bits of wisdom found in fortune cookies…. I’ve been so ashamed, but I feel so much better knowing I’m not alone.! No shame 😀 I’ve found slips of paper and notes from forever ago and still won’t throw them away ~ one day someone is gonna come in and say, “What the HELL is all this stuff?” Bwahahahahaha! I would so have that tattooed on somewhere special with a few flowers and maybe a little bird or bumble bee. Awesomeness…. Yuup!!! I don’t know if this little ritual is also part of your routine for fortune cookies, but I have an aunt who insists that one picks “naked” or “in bed” and then you must tack that little ditty choice onto the end of the fortune…..
Susan ~ Bwahahaha ~ I’ve heard that before, too funny…hmmmm, I’ll have to make that a question on my Facebook page!! Thanks for the reminder ~ Cheers!